Born and raised in Phoenix, I’ve grown a deep appreciation for the Sonoran Desert and its arid beauty. 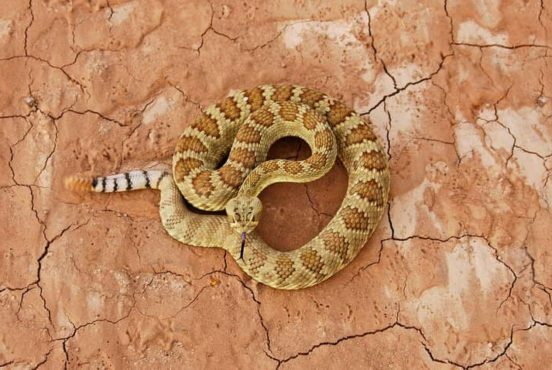 But living among cactus and coyote also stirs an endless longing for water in the wild. There’s something about a trail meandering through a clear creek, or the way summer’s first monsoon thunderheads roll over the valley that’s scarce and restorative. Fortunately, Arizona has more than 100,000 miles of river, creek, and stream. Many of those are seasonal and intermittent, and countless others have been permanently changed or lost by manmade diversions and dams. What remains offers plenty of watercourses to explore, and when we’re lucky, waterfalls. Here’s a look at some of Arizona’s most popular falls accessible by hiking and backpacking. It’s not an exhaustive list, and we’ve purposely excluded the falls in Havasupai to focus on the Copper State’s lesser-known gems. Hikes to each location vary from short strolls (Apache Falls) to those deep in the Grand Canyon (Ribbon Falls) requiring multi-day backpacking trips and months of advance planning. If for some reason you choose to stick to the lakes and the rivers that you’re used to, don’t say we didn’t try. Happy exploring. Cibecue Falls is located about 2.5 hours east of Phoenix, on White Mountain Apache tribal lands. The hike is a relatively easy out-and-back trek up Cibecue Creek with little shade along the way. When the water’s clear, the falls resemble a smaller version of something out of Havasupai, though the creek and falls can get murky after rain. A permit’s required to visit the falls, and primitive campgrounds are also available in the general area. Its location and picturesque backdrop make Cibecue Falls an ideal daytrip or over-nighter when the weather’s good and skies are clear. The Sabino Canyon Recreation Area receives more than one million visitors each year, so Seven Falls isn’t exactly under-the-radar. But this hike through Bear Canyon is worth braving the crowds, and you can hit the trail on an off-season weekday for a less crowded experience. From the Visitor Center, you can take a tram to the Seven Falls trailhead or hike the near-two miles yourself. The way from there winds through stunning desert and canyon scenery leading to the falls. Visiting in early spring or after rain is a great way to see Seven Falls in action, but the hike’s a worthwhile challenge even when the creek’s low. Tanque Verde Falls is about 20 miles east of Tucson, but feels more remote than its location lets on. A sub-two-mile hike leads to several waterfalls, the taller of which takes some scrambling to get to, though it’s worth the extra effort. This is a great family hike, but the wash can be deceptively dangerous. More than 30 people have died here over the years, and scores more have been rescued during monsoon storms. It’s best to enjoy this hike in the spring, fall or winter to avoid the flash floods that may come after a desert downpour. Depending on the water level, the creek may have pools and small falls that make the short hike interesting along the way. It’s a popular spot for cliff jumping and college students, making it an ideal area for adventurous hikers. When Elisha Reavis moved into the Superstition Mountains in the 1870s, he was widely considered the first Anglo-American to do so. Today, the valley, ranch, creek, and waterfalls that bear his name make up some of the most spectacular scenery in that range, and Reavis Falls is its crowning jewel. Getting to this 140-foot fall is challenging, however, and this isn’t a beginner’s hike. From the Reavis Ranch trailhead, you can expect a round-trip of at least 13 miles, and even more if you swing by the ranch or see other parts of the area. This hike’s ideal when the weather’s nice, and after rain the falls can be flowing well into a large-sized pool. Reavis Falls flows best when snowmelt from peaks in the eastern Superstitions makes it way down the mountains. The rigor of this hike makes it fun no matter what the waterfalls’ status, and if you can swing it, a night or two at Reavis Ranch is a backpacking bucket list item worth checking off. Like Cibecue Falls, Pacheta Falls is located on White Mountain Apache tribal lands, but that’s where the similarities end. Instead of stark desert scenery, Pacheta Falls is surrounded by forest greenery and the pristine wilderness that’s come to define this remote area of Arizona. The 130-foot falls are just downstream of the Ess Creek and Pacheta Creek confluence, and before Pacheta Creek meets the Black River. Getting there isn’t easy going, but the drive itself is an adventure that makes the 1.5-mile hike in (depending on where you start) more than worth the journey. The falls are a welcome departure from Arizona’s typical desert waterfalls, and its location means you won’t battle the crowds the way you might at Seven Falls or Tanque Verde. A special use permit is required from the White Mountain Apache tribe, and we recommend bringing maps of the area, as signage is minimal. In 2016, Fossil Creek began using a permit system to curb the crowds, trash, and rampant destruction of the area. The years since have seen a 50% drop in trash, says one National Forest ranger, and the crowds are now manageable, especially during peak summer times. Like the falls of Havasupai, Fossil Creek is an Eden-like watercourse with clear water and geologically unique features. This isn’t just a fun watering hole that gets wild in the summer – it’s the fourth largest travertine system in North America. It’s also one of only two designated Wild and Scenic Rivers in Arizona. Today, the permit system allows you to visit the area from one of nine parking areas depending on your itinerary. The most popular route is the Waterfall Trail, a short 2-mile round-trip hike that brings you right to the action. For a more adventurous trip, consider taking the 8-mile round-trip Fossil Springs Trail No. 18, which brings you to the old damn rather than the waterfalls. This hike is only recommended for experienced and prepared hikers, and the Forest Service recommends avoiding the trail in the summer heat. Even with the permit system in place, the summer crowds at Fossil Creek ensures you won’t have a solitary experience. If you’re looking for a more quiet visit, consider going offseason: permits aren’t required from October 2 to March 31. In 1972, Sycamore Canyon Wilderness became Arizona’s first designated Wilderness Area. Its 55,937 acres of solitude include Sycamore Falls, a 100-foot waterfall near the headwaters of Sycamore Creek just southeast of Williams. It’s a gorgeous spot by any standard, but in the springtime the falls come roaring to life. You can also catch the action after summertime rain; a few years back, we visited in August and found the falls flowing well after a few inches of rain that morning. The best views of the falls come from the Sycamore Rim Trail, a mellow loop offering multiple access points around the canyon and surrounding area. The loop is about 11 miles, but depending on your route and explorations it can be closer to 13 miles. For quicker access to the falls, forgo the loop for the trailhead closest to the falls. If you’re staying overnight, check out White Horse Lake Campground nearby. It offers more than 90 campsites, many of which can be reserved online. 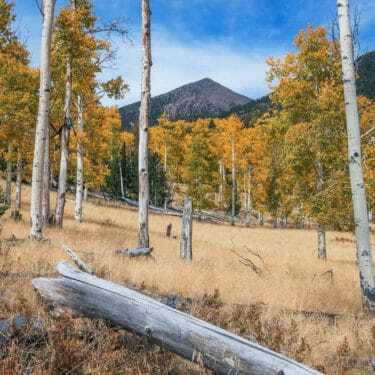 For other ideas in the area, check out our list of 30 incredible Flagstaff hikes. 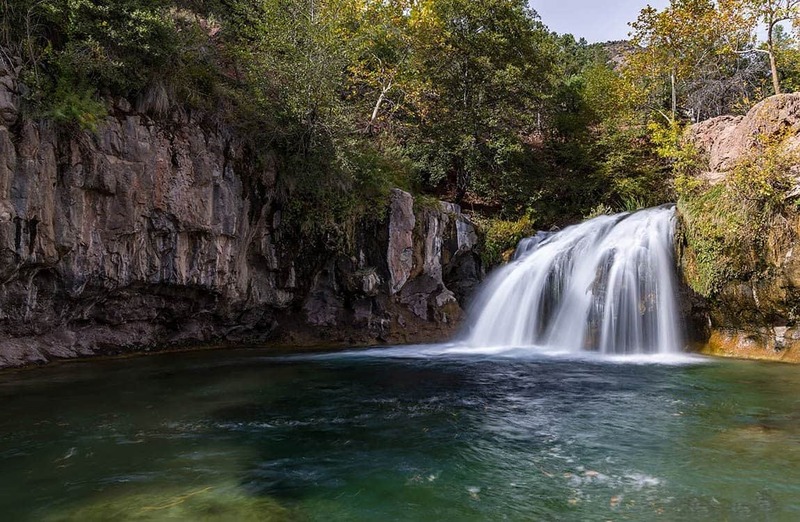 Travel 10 minutes north of Payson on Forest Road 199 and you’ll hit one of the most iconic hikes in Arizona, known for its pools, falls and small swimming holes along the East Verde River and Ellison Creek. This hike is all about exploration: start from the Water Wheel Day Use area between First and Second Crossing Campgrounds and drift along the water’s meandering route until you reach the confluence of the East Verde and Ellison Creek. From there, follow Ellison Creek upstream until you reach its mellow falls. It’s not a long stretch from your starting point to each of the main falls, so exploring beyond the popular swimming holes is a good way to see more of the area. 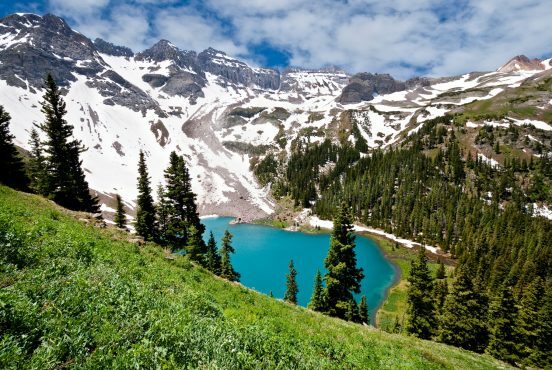 Like many high-country creeks, this area is prone to flash floods during the summer, so be mindful of storms in and around the area before and during your adventures. Havasupai may be the Grand Canyon’s premier waterfalls destination, but Grand Canyon National Park is home to a handful of impressive and accessible falls. Ribbon Falls, located on the west side of Bright Angel Creek on the North Kaibab Trail, offers lush scenery and a 100-foot-plus waterfall that drops onto a distinct travertine mass. 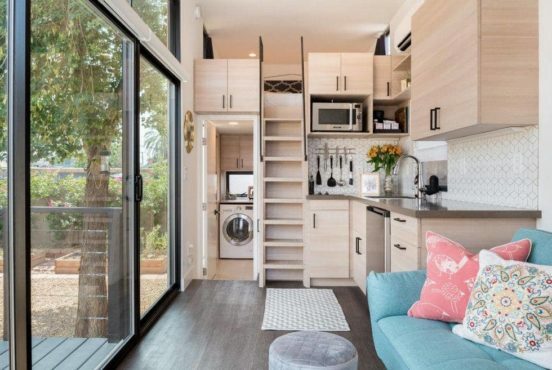 To set up base camp near the Grand Canyon, check out our list of nearby Airbnbs. For Phoenicians, local waterfalls are few and far between. Although Camp Creek Falls lacks the majesty of larger falls in northern and southern Arizona, it’s a short drive from the metro area, making it a convenient day trip into beautiful desert terrain. The three-to-four mile hike starts at Cave Creek Road and follows Blue Wash up into Camp Creek. It’s your standard desert wash hike and after rain there’s plenty of water in the falls and small pools downstream. This granite waterfall may not be massive, but for city dwellers in the desert, it’s more than enough to warrant a trip out to the Tonto Hills subdivision. Catch Wolf Creek Falls in the spring when snowmelt from the Bradshaw Mountains brings this area to life. Before Wolf Creek meets the Hassayampa River downstream, it cascades over a granite face some 60 to 90 feet into the pools below. From Wolf Creek Road, you can take a 5-plus mile loop on Wolf Creek Loop Trail 384, then break off to see the falls at the right juncture (you’ll see signs). For a faster hike, take the southern section of that trailand see the falls in less than two miles roundtrip. 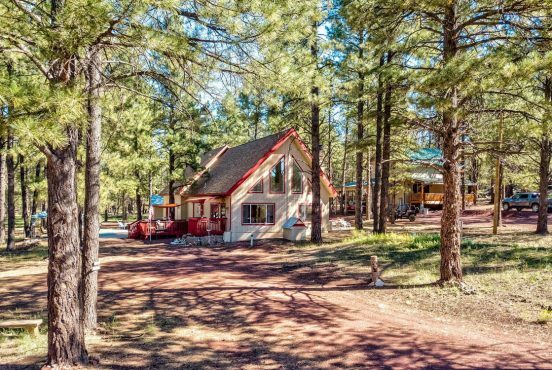 Nearby Lower Wolf Creek Campground and Upper Wolf Creek Group Campground offer excellent camping choices for those looking to stay for the weekend. Bridal Wreath Falls lies south of Tanque Verde Falls and has much the same appeal: easy to get to from Tucson, far enough to temporarily escape the sprawl of the city. This 5.5-mile hike starts at Douglas Spring trailhead and winds pleasantly through the Rincon Mountains. Like other falls around Tucson, it gets busy during peak times and seasons, and minimal shade along the way means you’ll want to avoid the hike in excessive heat. Desert flora at the falls is hard to beat, and makes for a great backdrop to enjoy before heading back to the city. 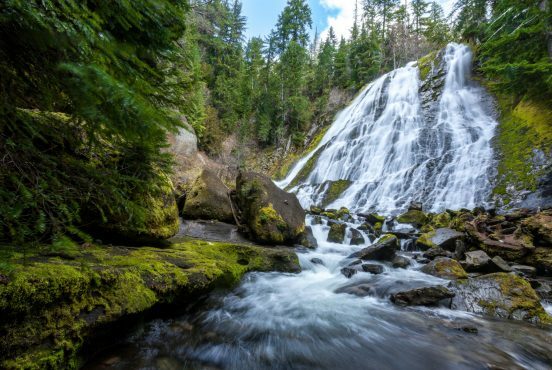 Its name may suggest a more brutal hike, but Massacre Falls can be reached by a relatively mellow 5-6 mile hike starting from Crosscut Trailhead off First Water Road. The area’s named after the 1840s Peralta Massacre, when a party of Mexican miners was allegedly slaughtered by Apache Indians as they attempted to carry gold ore down south. The Massacre Grounds trail is an easygoing hike through desert landscapes typical of the Superstitions, and if you visit in the spring or after rain, you’re more likely to see water in the streambed and falls. 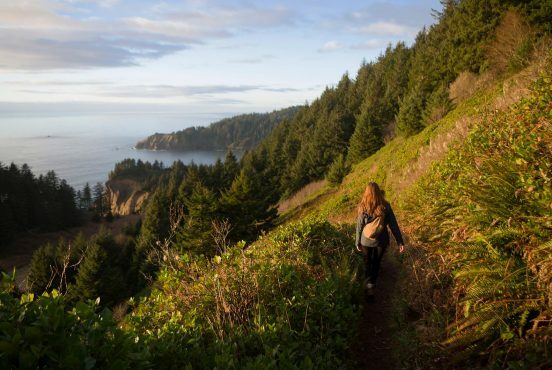 A spring hike can also mean wildflowers and blankets of green that make the trek pleasant, waterfalls or not. Sometime in the 1970s, the San Carlos Apache tribe dammed up Seneca River to create a lake and spent more than half a million dollars building up a small resort area. The dream didn’t last long, and today the area is largely abandoned. Though the river is now a shadow of its former self, Seneca Falls still flows, especially after rain. Water from the riverbed falls a few hundred feet down to a small pool below, and if you’re in the area, it’s the perfect place to stop and enjoy the remote scenery. There’s not much of a hike to get to the falls, so we wouldn’t consider it a premier hiking destination, but if you time your trip after the right storm, Seneca Falls offers a stunning viewing experience that’s worth a visit. Apache Falls is one of the few waterfalls in Arizona located on a river instead of a creek, so it has a flow and volume that most of our state’s falls lack. It’s easy to get to, with a one-mile round-trip hike from the parking lot, but an off-trail scramble upstream is a good way to see more of the Salt River. Snowmelt makes the falls most impressive in the spring, but it flows year-round and makes for an excellent swimming hole in the summer. You’ll need a permit from either the White Mountain Apacheor San Carlos Apache tribe, and if you have the time, get your permit from the former and hit Cibecue Falls just a few miles northwest of Apache Falls. Ash Creek Trail #307 is in the highest of the Sky Islands in Arizona – the Pinaleño Mountains – and offers a challenging hike dropping nearly 5,000 feet in elevation from its starting point. You’ll wind through a range of landscapes, from lush forest to desert scrub. You’ll also pass remnants of the past, including a historic sawmill and old logging equipment from bygone eras. About halfway up the trail you’ll spot Ash Creek Falls. The creek isn’t big, but it runs run year-round and fluctuates based on current conditions. When it’s flowing well, Ash Creek Falls resembles something out of Yosemite, a spectacular cascade engulfed by forest and flanked by sheer rock walls. At the time of this article (March 2018), Ash Creek Trail is temporarily closed until July 2018 due to the 2017 Frye Fire. Look for updates on the Coronado National Forest site when its reopens. The Grand Canyon’s tallest falls can only be accessed by backpacking, and many hikers recommend at least three nights in the canyon to truly enjoy the trip. Grand Canyon NPS recommends spending your first and last nights at Phantom Ranch or Bright Angel Campground and booking a night in between at Clear Creek Use Area. Cheyava Falls is about five miles up Clear Creek, and if you’re visiting in the spring, be sure to wear shoes and clothes suited for creek crossings. The hike follows the creek bed and may be slow going, so leave plenty of time for the 10-mile round-trip excursion. The falls are most active in the spring when the creek swells from snowmelt on the North Rim. This is also the busiest season for this particular itinerary, so be sure to plan your trip and secure a backcountry permit months ahead of time. The best views of Winn Falls in the Chiricahua Mountains come from the viewpoint on Greenhouse Trail #248. From the trailhead, this hike climbs more than 2,000 feet through high divides between canyons and finally to the Crest Trail at Cima Park. It’s a challenging hike with gorgeous switchbacks, the occasional downed tree on-trail and plenty to see on the way up. You’ll reach the Winn Falls Viewpoint in less than two miles, but it’s worth continuing your hike if time permits. Before you reach the end of the trail, you’ll find some old Forest Service cabins built in the 1930s. The falls tumble more than 300 feet and even from a distance you can appreciate its magnitude. As usual, spring is a great time to view the falls as snowmelt in the area rushes down the mountain. You’ll find Romero Pools in the 5,500-acre Catalina State Park just north of Tucson. From the trailhead, you’ll gain about 900 feet of elevation in just under three miles. There you’ll find chilly, pleasant pools and small waterfalls surrounded by desert rock and vegetation. To see more of the Catalinas, continue past the pools up to Romero Pass, adding more than four miles and 3,300 feet of elevation to your trek. 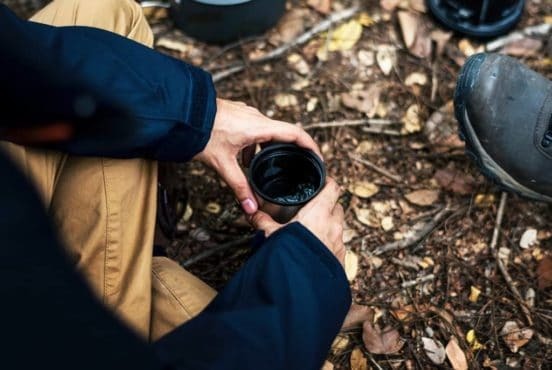 With either route, get a head start to beat the crowds and be sure to take plenty of water if you’re hiking in the warmer months. Carr Canyon Falls is visible from most of Sierra Vista, but an up-close visit is a must for waterfall-chasers in Southern Arizona. Take Carr Canyon Road down to Ramsey Vista Campground, where the Carr Peak Trail takes you up several thousand feet into the Huachuca Mountains. To reach the summit at 9,230 feet, take the short Carr Peak Spur from the main trail. The view here is worth the extra push at the end. Deer Creek Falls is one of the Grand Canyon’s more impressive and accessible falls. It’s located on the north side of the Colorado River, where Deer Creek drops more than 180 feet to the canyon bottom. Most commercial rafting trips will stop here, and if you’re backpacking, take the Bill Hall Trail from the North Rim near Monument Point. Waterfall Wednesday! Thunder River in the Grand Canyon is one of the shortest rivers in the U.S. at only a half a mile long. It is also a rare instance where a river empties into a creek (Tapeats Creek). 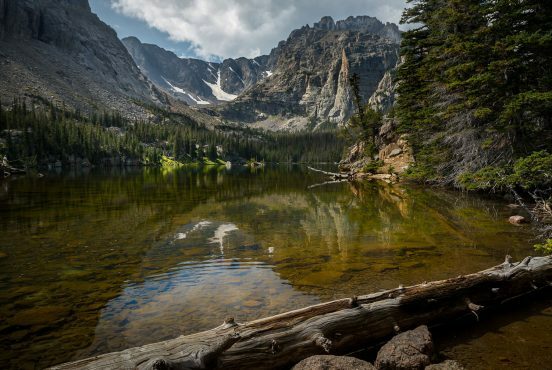 Accessed either by a multi day backpacking trip or a dayhike from a river trip, its refreshing waters are a welcome respite from the surrounding arid land. Backpacker outlines a solid itinerary taking you through some of the canyon’s most beautiful country in about 21 miles and five days – not a bad way to spend a week. This route also includes a stretch on the Thunder River Trail, where you can see Thunder Falls before you switchback down to the Colorado River along Tapeats Creek. To explore more of the state, check out our guide to camping near water in Arizona, the best hiking in Peoria and Glendale, or one of our favorite places to backpack – Aravaipa Canyon.